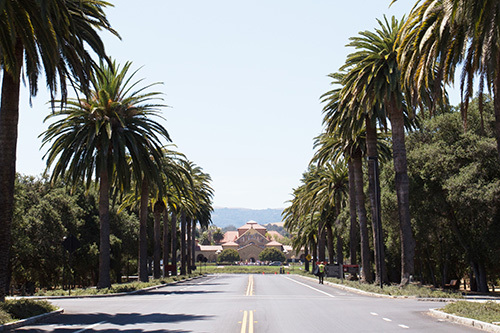 Stanford University is well-known for its brilliant solutions to some of the world’s most pressing problems in medicine, computer science, renewable energy, and a host of other disciplines. But when it came to storing supplies and equipment storage for their football program and sports medicine clinic, the university lacked a cohesive strategy. Sports items were stored in small, cramped spaces throughout the university’s main athletic facility, the Arrillaga Family Sports Center. Athletes and staff crammed stuff into any space they could find. And as a result, the facility’s disorganized storage was leading to frustration and wasted time. 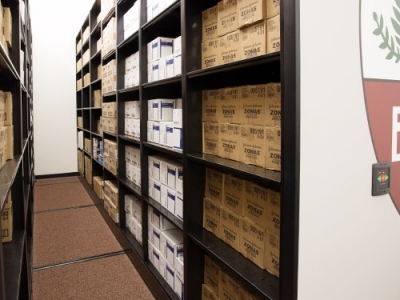 Without a coherent storage plan, and with no single area large enough to accommodate all the items that needed to be stored, the university’s valuable athletic supplies and equipment were often difficult to find. 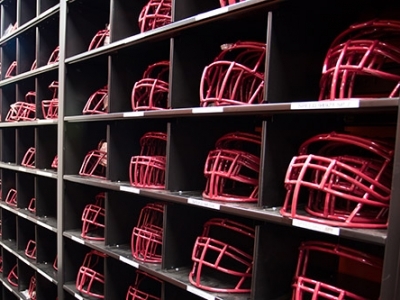 When a major renovation project presented the opportunity to rethink their athletic equipment storage, the university engaged Systems and Space to assess storage needs and recommend solutions. The Spacesaver design consultant made it a priority to help faculty and staff understand the possibilities offered by the new space. Given that items of all types were scattered around the facility, it made sense to consolidate items and designate one area for football equipment storage and one area for sports medicine storage. While determining square footage was a good starting point, the consultant knew that recording the ceiling height was also important in calculating the amount of storage space available. She measured the space in all dimensions and noted obstructions like load-bearing columns, ductwork, and sprinkler systems. Given the limited available space, the usage patterns of the athletes and staff, and the facility’s current and projected storage needs, the planning group decided that powered high-density storage systems should serve as the core of both areas. A high-density storage system consists of shelves or other storage units mounted on carriages, which move along rails installed in the floor. This means that wasted aisle space is eliminated because the shelves can be stored close together. When a user needs to access stored items on a powered high-density system, he or she can simply press a button on an electronic touchpad to set the units in motion and create an aisle at the point of need. 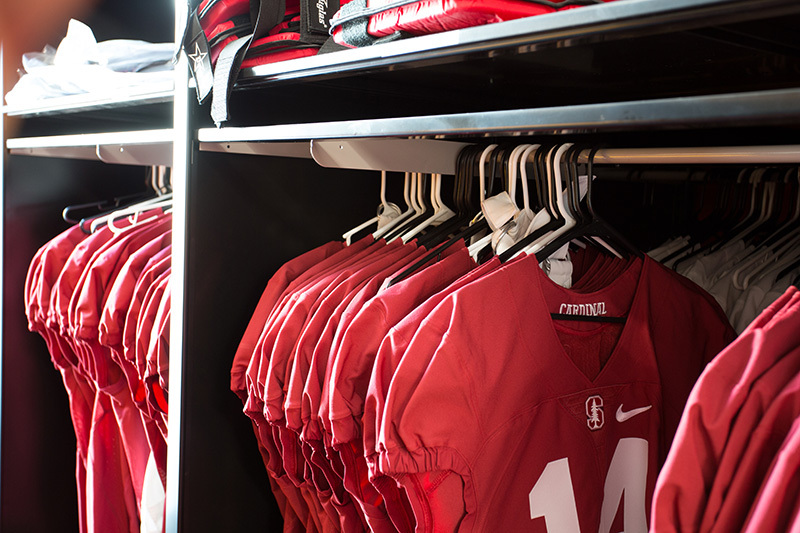 In Stanford’s case, the high-density storage system eliminated wasted space, allowed for more items to be stored in the same area, and provided safe and convenient access for busy athletes and staff. High-density storage systems, also called compact shelving, eliminate wasted aisle space by storing shelving units close together. The shelves move on rails, so students and staff can create an aisle at the point of need using electronic controls or mechanical-assist handles. After the basic storage framework was established, the Spacesaver design consultant referred back to the master list of items that needed to be stored in each area and specified bins, hangers, steel pegboard, and other solutions to ensure that every item would have a home. She estimated the number of linear feet required to store the items in the proper containers, on shelving, or on hangers. Finally, she created a detailed plan to ensure that there would be enough space to accommodate all items. Because empty shelves have a way of quickly becoming cluttered and disorganized, Stanford staff wanted a plan that would create a clearly marked “home” for all the items that needed to be stored, from crutches to shoulder pads to dress belts. The items needed to be not only easy to find, but also easy to put away — because for busy college athletes, a plan that includes inaccessible or inconvenient storage devolves pretty quickly into no storage plan at all. The storage plan helped staff and students understand the possibilities the new space could offer, as well as their role in keeping the system tidy and well organized. The end result was a designated place for every item on Stanford’s long list of items to be stored. Take a look below at some of the details. With configurable shelving, bins for small items, and garment hangers and other customizations, the new storage areas truly have a place for everything. 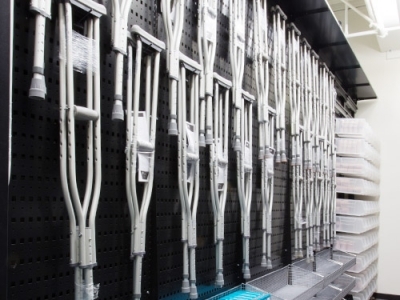 The Sports Medicine department’s crutches are hung on configurable steel pegboard panels. By storing pairs of crutches on hangers, Ruiz ensured that faculty and staff could quickly and easily retrieve the necessary size and also take a quick visual inventory of the crutches available. 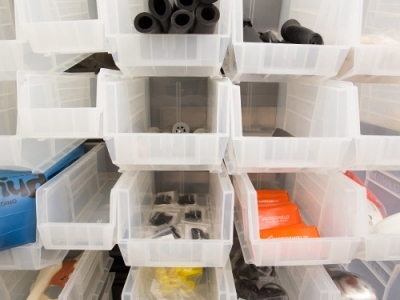 The steel pegboard’s durable powder coat paint withstands repeated use and integrates seamlessly with the adjacent modular bin shelving system. Spacesaver’s modular bin system, called FrameWRX® on EZ Rail®, is ideal for athletic equipment storage, particularly for sports medicine supplies. The systems keeps smaller items, like wraps and bandages, organized and close-at-hand. The bin shelving system consists of a unique rail system attached to a frame, along with components like bins and shelves that are installed on the horizontal rail. Staff can swap out bins and shelves and even change the spacing of the rails, which means they can take control of the system and adapt it to changing needs over time. Spacesaver’s 4-post shelving is universally slotted, resulting in a great deal of configurability. Individual 4-post static shelving units can be equipped with lockable doors, bins, and shelves, as well as a broad array of storage accessories. Boxes of bulk supplies in the sports medicine area are stored on 4-post shelving units that were mounted on carriages and rails to create a compact mobile storage system. Stanford opted for custom decals on the storage system’s end panels that result in a cohesive look that boosts team pride. End panels for Spacesaver products are available in a wide variety of sleek finishes that can enhance any facility’s interior design. 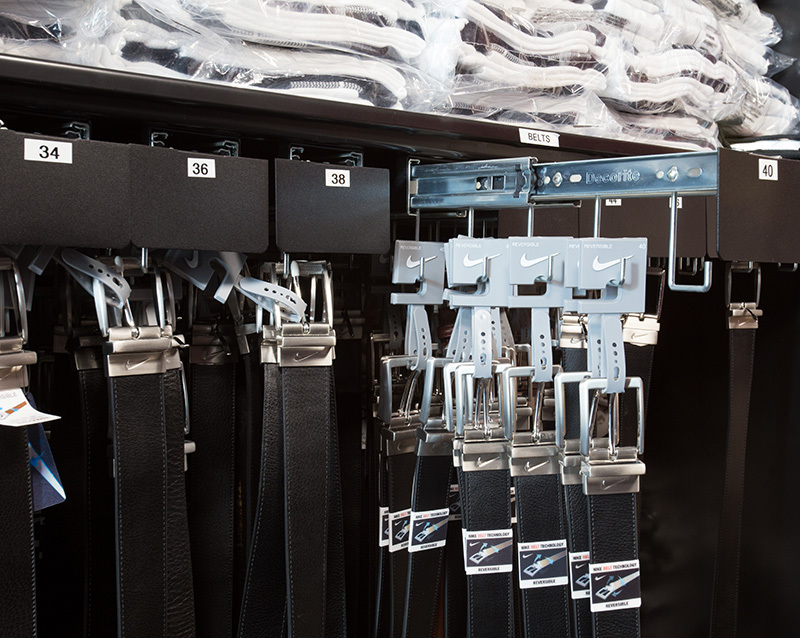 Mobile 4-post units are configured for sport-specific uses in the football equipment room. The units can be outfitted in a number of ways, including with bars for hanging jerseys and other clothing, with shelves and vertical dividers for helmet and facemask storage, or with perforated shelving for optimal ventilation. As in the sports medicine area, shelving units were mounted on rails to create a compact storage system. An electronic touchpad system provides safe, convenient access at the point of need. Systems & Space provides ongoing service for this project. As the athletic facility’s storage needs change over time, Spacesaver and Systems & Space remain committed to serving students and staff. Learn more about our athletic storage solutions by visiting our education market page, or by downloading a printable version of this page.